UPDATE: This contest is over. The winner’s were picked on Smoke Night LIVE. Congratulations to pickologist, TheWB, and hkap. What’s better than winning a box of Grade-A, limited edition, premium cigars? Winning said box simply… BECAUSE CIGARS! Contest Theme: Why? B’CUZ CIGARS! There are times when we like to see just how creative the Dojo community can get, Photoshopping and creating hilarious masterpieces in order to score some epic prizes. And then there are times when we we want to relax a bit and give away some premium prizes simply #bcuzCigars. 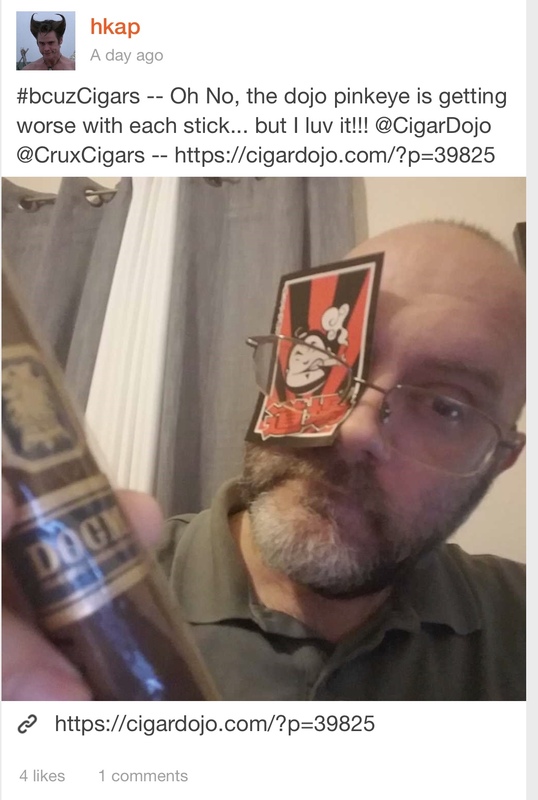 This is a hashtag started by Cigar Dojo and frequently used throughout our social media; now we encourage you to try wielding this mighty “tag of hash” in an attempt to take home some Crux glory. When entering for this contest, ask yourself, “Why am I doing this?” If the answer is, “Because cigars,” you’re on the right track! Our grand prize winner this week will take home the most sought-after cigar in the entire portfolio from Cruz Cigars—the rare Crux Limitada PB5 2018! Only 1,000 boxes of 10 cigars have been rolled for 2018, featuring a Nicaraguan Engañoso wrapper, Connecticut Broadleaf binder, and fillers of Nicaragua and the DR—rolled in a Cuban box-pressed 5¾” x 54 format. When one comes across an outstanding wrapper leaf, even in a limited amount, it begs to be used. Regardless of the number of cigars produced. Thus we offer the Crux Limitada. A series of limited released cigars based upon the love of exceptional tobacco. Unique and well worth the effort. Crux Limitada Show Exclusive 2018 features a similar blend to the Limitada PB5, being rolled in a smaller 5″ x 52 robusto format. Like the PB5, only 1,000 boxes have been released for 2018, but the cigars are only offered to retailers that purchased during this summer’s IPCPR trade show. The Limitada IPCPR features the amazing Engañoso wrapper over a premium blend of filler and binder tobaccos. It is completed with a box press and detailed Marblehead™ finish. Since its introduction, each release has sold out in a matter of days to our Retail Partners across the country. It has become a favorite of consumers and reviewers alike, garnering Cigar Of The Year honors. Crux Epicure is the most refined and epicurean release from Crux Cigars, offering a soft and nuanced blend that derives its name from the cigar’s famed Cuban counterpart (Hoyo de Monterrey Epicure). Our third place winner this week will receive a full box of 10 Epicure cigars in the 6¼” x 52 Toro format. Flavors range from sharp white pepper and mineral, to creamy coffee, milk, salty crackers, and even lemon cake. Our contest this week will run from Wednesday, December 5th at 6pm (EST) until Friday, December 7th. The winners will be announced during this week’s episode of Smoke Night Live, featuring Casey Haugen of Crux Cigars. Contest presented by CigarDojo.com. This contest and other contests on the Cigar Dojo website and Cigar Dojo app are NOT sponsored by Apple inc. or any of it’s partners in any way. Estimated retail value of prizes $345.00. No substitution, transfer, or cash equivalent of prizes by any winner. No purchase necessary. Winners MUST email their name and shipping address to sensei@cigardojo.com – failure to claim prize within seven (7) days from the win date shall be deemed null and void and shall result in forfeiture. Must be 21 or older to participate. Odds of winning depend on number of customer entries, winners picked at random contestants may have multiple entries. Taxes and fees, if any, are the responsibility of the winner. Employees of CigarDojo.com are ineligible. This contest is void where prohibited by law and subject to local, state and federal law. Only original images or original compositions will be considered in the final selections. We are not responsible for prizes that may become lost or damaged during shipping. Many will enter, few will win.